Monarch Air Group provides private air charter in Kelowna, BC, Canada. Our clients benefit from top-notch service, unrelenting dedication to safety, wide selection of aircraft, and years of experience in chartering private jets. To obtain a free quote, please use our online quoting tool provided below, or call toll free 1-877-281-3051. Monarch Air Group provides air charter flights in and out of Kelowna, British Columbia, Canada. Located in the Okanagan Valley of BC, on Okanagan Lake, Kelowna is a city that situated 284 miles east of Vancouver and 80 miles north of Canada-United States border. It is the place of the Father Pandosy Mission – the first white settlement in 1859 in the Okanagan Valley. Being among the fastest growing cities in BC, Kelowna is transportation, cultural, service and business center. The city’s economy is supported by such industries as manufacturing, agriculture, construction, forestry, social and health services, tourism, and retail trade. The city is a home to the University of BC’s Okanagan Campus and to Okanagan College. 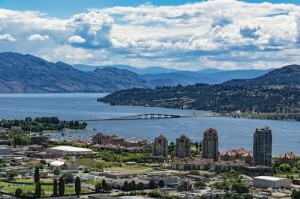 Kelowna boasts pristine lakes, beautiful parklands, pine forests, sandy beaches, and numerous vineyards and orchards. Most notable attractions are the Okanagan Military Museum, the Okanagan Heritage Museum, the BC Orchard Industry Museum, the Rotary Centre for the Arts, the Kelowna Public Art Gallery, the Geert Maas Sculpture Gardens and Gallery, the Kelowna Community Theatre, the Myra-Bellevue Provincial Park, and Mission Creek Regional Park/Greenway. Okanagan Lake offers plenty of actives from boating, swimming, water-skiing, fishing to windsurfing. There are luxurious golf courses and internationally known wineries, attracting tourists from around the world. The city has easy access to such ski resorts as Silver Star, Sun Peaks, and Big White. Being among major destinations of Canada, Kelowna welcomes business and leisure travelers and is served by Vernon Regional Airport (YVE), Kelowna International Airport (YLW) and Penticton Regional Airport (YYF).